Mansfield Town have secured special dispensation to sign Lewis Price from Crystal Palace on an emergency loan to solve their goalkeeping crisis. Regular keeper Alan Marriott has dislocated a finger, while reserve Ian Deakin has a thigh problem. 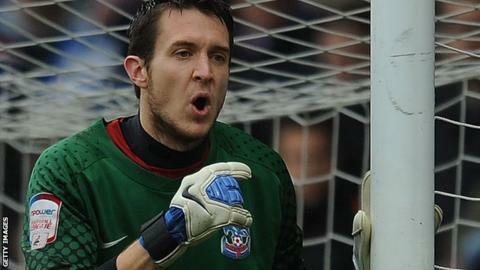 Wales international and former Ipswich and Derby man Price, 29, joins until the end of the season. "He's an experienced boy who can come in and do a job straight away," manager Paul Cox told BBC Sport. Marriott had previously been an ever-present for the Stags, who are searching for a fourth successive win against League Two leaders Rochdale on Saturday. "It's a shame for Alan, but these things happen and you have to get on with it," added Cox. "We're not sure yet how long he and Deaks [Deakin] will be out."